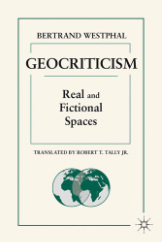 Bertrand Westphal's Geocriticism: Real and Fictional Spaces, trans. Robert T. Tally Jr. (New York: Palgrave Macmillan, 2011). Although time traditionally dominated the perspectives of the humanities and social sciences, space has reasserted itself in the contexts of postmodernity, postcolonialism, and globalization. Today, a number of emerging critical discourses connect geography, architecture, and environmental studies, among others to literature, film, and the mimetic arts. Bertrand Westphal’s Geocriticism explores these diverse fields, examines various theories of space and place, and proposes a new critical practice suitable for understanding our spatial condition today. Drawing on a wide array of theoretical and literary resources from around the globe and from antiquity to the present, Westphal argues for a geocritical approach to literary and cultural studies. This volume is an indispensable touchstone for those interested in the interactions between literature and space.